The latest Bergdorf Goodman look-book just arrived in my mailbox, so I thought I’d mention Bergdorf’s upcoming beauty event. 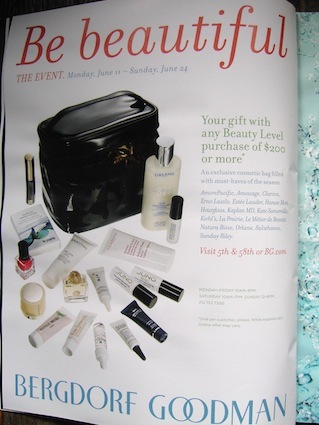 It runs from Monday, June 11 through Sunday, June 24, and with any Beauty Level purchase of $200 or more, you’ll receive a cosmetics bag filled with deluxe beauty samples. Featured brands this time around include AmorePacific, Amouage, Clarins, Erno Laszlo, Estée Lauder, Hanae Mori, Hourglass, Kaplan MD, Kate Somerville, Kiehl’s, La Prairie, Le Métier de Beauté, Natura Bisse, Orlane, Sulwhasoo, and Sunday Riley. Many individual counters will also be offering additional gifts with purchase during this event. Thank you so much for posting this! I have been waiting to order some things and was basically holding out for some type of gwp! Love your blog too, keep up the great work! Thank you so much, Tammy! The gift bag looks pretty good, doesn’t it? Do you know if this will be online? Hello, Tammy — I’ve just checked with BG, and yes, the offer is available online as well as in-store.